Yes, something has changed. I don’t know what it is, but it has become IMPOSSIBLE for me to successfully bake a batch of cookies. I mean cookies that are ooey-gooey good. The kind that people want to eat. At best, mine aren’t burned, technically, but definitely crispy. That’s become my code word. “They are NOT burned. They’re crispy.” Which isn’t necessarily a bad thing. But, I would love to be able to confidently bake a batch of cookies that doesn’t require gallons of milk to choke them down. I’m not even talking about the kind of baking that involves flour and sugar and eggs and whatever else cookies are made of. I’m talking about the pre-made Pillsbury cookie dough you buy at the store. It’s already pre-cut into cookie shapes! All I have to do is transfer them from the packaging to a baking pan, stick it in the oven and…here where it gets tricky…REMOVE them from said oven after about 10 minutes. The “removal part” I’ve learned, is key to the whole cookie-baking process. I know what you’re thinking. And, YES I DO set a timer. And, I’ve even figured out that I shouldn’t stray too far from the oven during that ever-important ten minute period, so as not to miss the buzzing alert. And, yet, every single time, I find myself sniffing the air, thinking “Mmmm….something smells good.” Which is probably the time I should head over to the oven and check on the cookies. But, I don’t because, in the matter of several minutes after depositing the pan into the oven, I’ve somehow forgotten that cookies are baking. Instead, I continue whatever I’m doing until I finally do remember. And then it’s always “OH SHI******….” Every. Single. Time. My sweetheart bakes wonderful cookies, and I imagine could be of help with a recipe or two if you want me to ask her. But you may want to see someone more professional about help with the A.D.D..
Marilyn…I am laughing so hard at your adventures in the kitchen. I, too, tried my hand at baking cookies one afternoon. I placed big chunks of the pre prepared Nestles Tollhouse cookie dough on the baking sheet, set the timer and waited patiently for my treat. 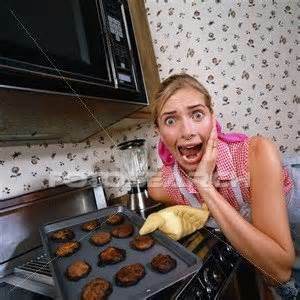 When I opened the oven, I discovered one LARGE cookie, the size of a hubcap!!!! BTW, I love my cookies burned/crisp!!!! Must be something in the genes, haha! Thanks for being a loyal fan of my silly rants!